I received a beautifully rebuilt coil ring from ReCoil about two months ago, and am just now mounting it. When I checked my clearances I got a surprise..
With the coil ring mounted to the block and a full set of shims under each bolt, my clearances ended up WIDER on one side by .020". After cutting an additional shim and raising it .020" I ended up with .028" at the top and both sides and close to .040" at the bottom. Now, I realize that additional clearance at the bottom is normal to allow for crankshaft "droop", but why did I start off with the ring being .020" low on one side? Re-Coil uses a surface grinder as a final operation to make sure the mounting surfaces and coils are all parallel, so the only thing I can think of is that the package may have been dropped in shipping and twisted slightly. Trust me, cast iron CAN bend a limited amount....I've seen it. Does anyone else have an idea for the discrepancy? As mounted right now, everything should function just as intended. When you rotate the flywheel is the clearance the same on both sides? It could be caused by the flange being crooked. If the same on both sides after rotation, I would suspect something else is off by .020. Check the field coil on a surface plate with a depth indicator - you'll see what the issue is. Just went through this a month ago with one of Mark's field coils - it was perfect on the coil faces and the 4 mounting bosses. 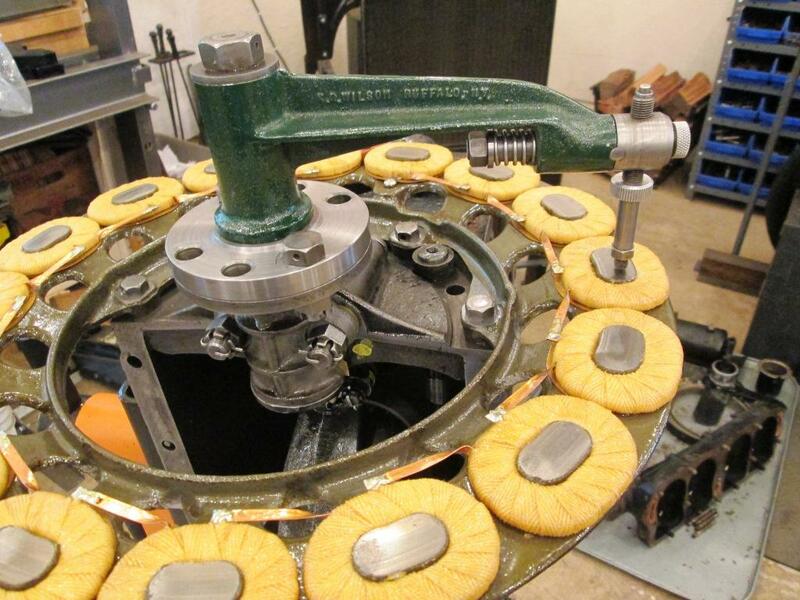 The crank shaft flange was machined true by the machinist who did the engine work. I was there when he verified it. When rotating the flywheel the clearances remain the same at all points, just greater on the one side. 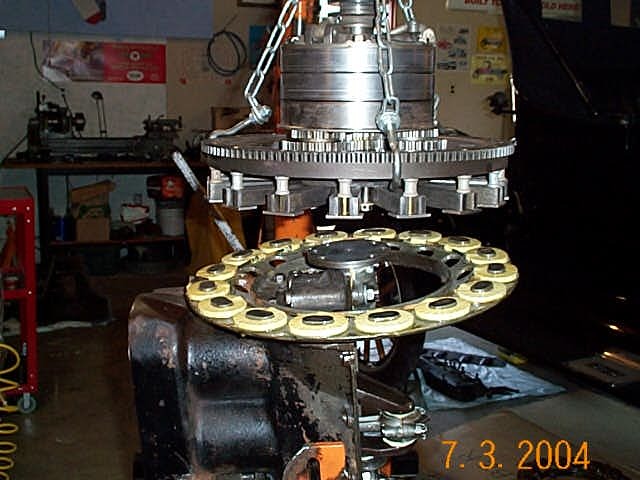 The mounting surface on the block where the ring mounts shows no abnormalities at all. By the way, I'm using a brass feeler gauge so as to not be misled by the magnetism. Since I've shimmed up the ring, the flywheel clearances are now pretty uniform. I may have to add a .006" shim on the upper bolt directly above where my .020" shim is as it seems to have a bit more clearance at that point. The right side has fairly consistent clearances at all points tested. Its as if the ring is warped slightly on the left side. Steve, I'll remove the flywheel again and rig up a dial indicator. I have confidence in Mark's work...it's what happened to it during shipping that concerns me. Make no mistake, the entire assembly is quite usable as it is, I'm just stumped by what would cause this. I,ve never found it as simple as putting in one shim! George, I'm with Frank on this one. Refitting a coil and expecting it to go back just as it was is a bridge too far. It often takes multiple shims at different points and a lot of trial and error to get the coil plate in the optimal position. Folks often devise a way of lifting the trans on and off just to make this operation easier. It pays to check the four mounting holes on the coilplate. When the plate is dipped prior to baking the insulation, that material will be around the holes too. Given that your plate has been surface ground to true up the magnet keeper heights, this should not apply in your case. I did just that as I've set up dozens of these "monsters" - just can't hoist them off like I used to ! You are correct Bill. If you space one side with a shim to lift it, the other goes down, and the two holes in between require shims too so the plate is not warped. This means lots of juggling and different shims to sort it out. I use strips of shim when doing the job to save having to remove the plate each time. Once the plate is set correctly, the strips are replaced with shims for a permanent fix. Thanks Bill and Allan.........I followed the exact same procedure when setting my magnet clearances. I couldn't figure out why it wasn't "leveling out"! Now I see the situation was pretty much normal. I'm going to add a couple of thin shims this morning and should be done. Oh, by the way, a quick spin of the crank produces voltage which is the whole point!